I just had to... Sorry guys. Rules: Be the last one to post and win! Aka: the never ending game. How did you get to so many freaking posts already?? No, that is not how you win. You only win if you have posts of quality, not quantity. 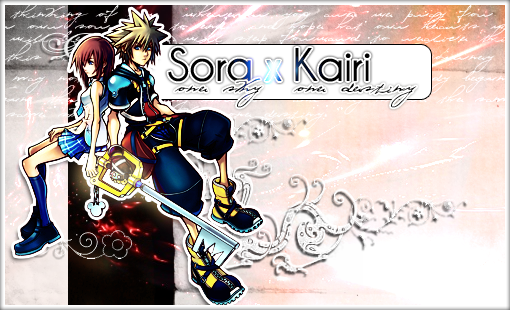 Oh you should read my posts in the Sora and Kairi section. Nah, I have seen some of the posts there, and I definitely don't doubt your ability to post quality posts about KH. Thanks! KH is undoubtedly my true passion. I love Bleach too, but KH is something for me. Oh and while you win in your work, I win in this thread. I'm the one who posted this thread, therefore I win. Duh. Damn you got me there. But I made the forum!!! Therefore I win! If I hadn't helped you out, you would've been forced to do it all yourself. And your other two admins wouldn't be able to see the admin panel. But I still win for being me. I now cut in and steal the win from both of you! Losers! *watches you burn and lose* Nope. Sorry Wanta, you can't win either. I'm actually legally supposed to win. But you won't because I am determined! I'll make sure to crush that determination. Not like winning in this thread isn't fun, but I'll be in the chatbox if any of you other lovable losers prefer instantaneous communication. Eh, I would go to the chat box, but I have to go for tonight. You'll never win! Can't you just accept that?? Too bad, your going down mon. Inoue wrote: You'll never win! Can't you just accept that?? I win, because I've got a banner. I win because I have both Ichi and Hichi as my icon. So? They're the same person (only one's evil) I've got Orihime in my banner. I win.